Keiichi Tanaami "solo exhibition at Kunstmuseum Luzern, Switzerland" will be held. Keiichi Tanaami's solo exhibition will be held at Kunstmuseum Luzern, Switzerland, in cooperation with Fumetto Comic Festival Luzern. This exhibition reconsiders Tanaami’s work in the perspective of Manga/Comic. "solo exhibition will be held at Kunstmuseum Luzern, Switzerland"
Keiichi Tanaami"Tanaami x adidas Originals" will be held at NANZUKA, Tokyo. 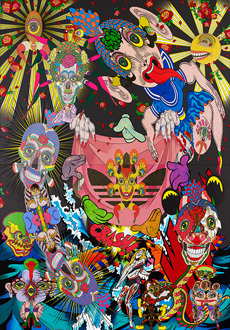 NANZUKA is pleased to present “Tanaami x adidas Originals,” a solo exhibition of new works by Keiichi Tanaami. This presentation is a special exhibition organized as part of “adidas gallery,” a new artist collaboration project by world-class sports fashion brand, adidas Originals. For this special collaborative exhibition, Tanaami presents 16 new works on canvas including those that feature adidas Original’s traditional “Trefoil” logo, as well as two new three-dimensional works. Shibuya Ibis Building B2f, 2-17-3, Shibuya, Shibuya-ku, Tokyo. 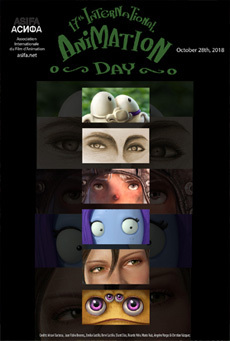 International Animation Day (IAD) 2018 – Coming Soon! On October 28th, 1892, a French inventor Emile Reynaud (1844 – 1918) made the first public performance of animation at the Grevin Museum in Paris, using his own invention "optical theater." 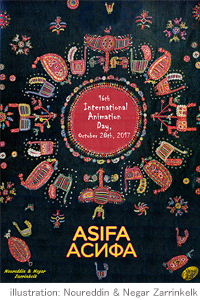 Since 2002, ASIFA and its National Groups have been celebrating this historical day as "International Animation Day (IAD)" , intending to promote and develop animation art all over the world simultaneously. Every year, about 40 countries participate in this celebration. "IAD 2018 in Japan" will be held in four cities – Kyoto, Nonoichi, Hiroshima and Atsugi – to show inspiring animation films of Japan and abroad. This year’s official IAD poster was created by René Castillo of ASIFA Mexico and his studio of animators, and it will be used around the world. Ángeles Vargas & Christian Vázquez. →"IAD 2018 in Kyoto" will be held on November 9th, at 18:00 ~, at Kyoto University of Art and Design. → "IAD 2018 in Nonoichi" will be held on November 18th, at 18:30 ~, at the Nonoichi-shi 'Camellia'. →"IAD 2018 in Hiroshima" will be held during October - November, at the Hiroshima City Cinematographic and Audio-Visual Library (Eizo Bunka Library), Yokogawa Cinema, Otomeza, Hiroshima Prefectural Art Museum. → "IAD 2018 in Atsugi" will be held on October 31th, at 17:30 ~, at Kanagawa Institute of Technology. HIROSHIMA 2018, the 17th International Animation Festival in Japan will be held from August 23rd to 27th! HIROSHIMA 2018 is almost around the corner! Looking forward to your participation! International Animation Day (IAD) 2017 – Coming Soon! "IAD 2017 in Japan" will be held in three cities – Kyoto, Nonoichi and Hiroshima – to show inspiring animation films of Japan and abroad. This year’s official IAD poster was illustrated by Noureddin & Negar Zarrinkelk, and it will be used around the world. →"IAD 2017 in Kyoto" will be held on October 20th, at 18:00 ~, at Kyoto University of Art and Design. → "IAD 2017 in Nonoichi" will be held on November 16th, at 18:30 ~, at the Nonoichi-shi 'Camellia'. →"IAD 2017 in Hiroshima" will be held during October - November, at Yokogawa Cinema, the Hiroshima City Cinematographic and Audio-Visual Library (Eizo Bunka Library), Kure Municipal Museum of Art. Copyright © 2017 ASIFA, ASIFA-JAPAN. All rights reserved.